Finally after months of waiting, it looks like the LG Optimus G Pro phablet has arrived at our shores. 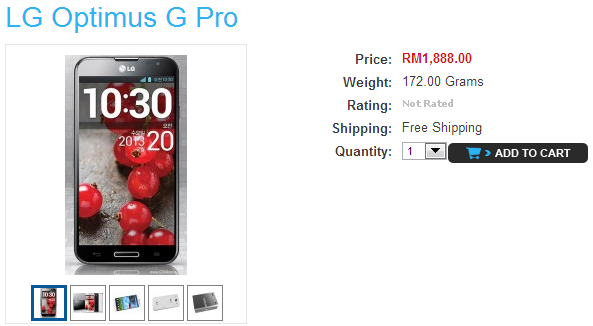 Late last night, IMCC Network announced that the LG Optimus G Pro has reached Malaysia with a retail price of RM1,888. For your information, the phablet has yet to be officially launched by LG themselves, which has been scheduled for next week. The LG Optimus G Pro is the latest flagship smartphone from LG that features a large 5.5” Full HD display with a pixel density of 401ppi. Powered by a 1.7GHz Quad-Core Krait Qualcomm Snapdragon 600 processor, the LTE-enabled device has 2GB of RAM on board and 16GB of internal storage expandable via MicroSD. It has a 13MP rear shooter and a 2.1MP front camera and a generous 3,140mAh battery on board. Software wise, the Optimus G Pro runs on Android 4.1.2 with LG’s very own UX that brings a host of new features such as Dual Recording, Dual Camera, VR Panorama, Pause and Resume Recording, Smart Video and more. Unfortunately though, with an event scheduled for 7 August to unveil a new device (rumored to be the LG Optimus G 2 powered by Snapdragon 800), it looks like LG is a little too late again. It’s disappointing how slow LG introduces devices to us Malaysians, when they finally introduced the Optimus G to us, the G Pro was already announced. Let’s just hope that a slightly more affordable price tag would attract potential customers. Because of its size – 5.5” display, the Optimus G Pro is typically compared with Samsung’s phablet, the Galaxy Note 2 that has a similar screen size as well. But the Optimus G Pro features slightly better hardware. The retail price of the Note II is RM1,999 while the G Pro retails at RM1,888. Will you buy the LG Optimus G Pro?